Be among the first to lay hands on the coolest and latest mobile phones, IT gadgets, and consumer electronics at the Mobite Fair, Midvalley. For those who wonder what Mobite stands for, its actually a combination of 3 words - Mobile, IT and Electronics, hence the name Mobite. Organised by Unified Distribution Techology along with various partners which includes Vivo, Kaspersky, Tunetalk, Techtitan and KooZaa. More about these companies will be explained below. 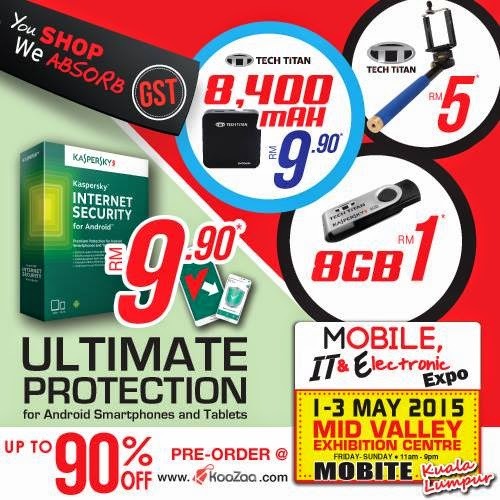 The Mobite Expo 2015 will run for 3 consecutive days, 1st May till 3rd May. The expo will also showcase more than 80 global brands and 300 booths - covering 3 main halls, making it among the largest consumer electronic event in the country to date. The beginning of the fair where everyone is queuing to purchase the RM1 pendrive, RM9.90 powerbank or the RM99 500GB external hardisk. The second when the hanger is open - everybody started rushing in. Our first stop at Acson airconditioning. Featuring one of their latest aircond with custom design. Not that it appeals to me, but I have to admit it does look pretty neat with additional wallpaper background. One of the co-presenters, Kaspersky, promoting its latest anti-virus program along with some awesome deals such as the buy-1-free-1 program. 6 months free data? Who would've thought of that insane idea. Apparently Tunetalk has and is implementing it. For more information regarding that, do visit them tomorrow (3rd May, Sunday) for more information! AMD was giving out free slurpee. As a Chinese, we must take whatever that is free. The AMD models as they will be happy to answer all your questions. Regarding AMD of course. Other prominent brands includes Lenovo and MSI are also available at the Mobite Expo. For those looking for a new gaming laptop, you'll have to pay them a visit. This was by far my one of my favourite booth. Simply because they have a 28cents promotion! I personally bought a Samsung 16gb hi-speed micro-sd card for 28 cents! Other items include a laptop backpack and a 16gb pendrive for 28 cents each. Aside from that, there are various other products for an extremely low price. The catch? 1 per customer - so choose wisely! Among all, this was the weirdest one for me. I mean, I get that they're trying to promote in a good cause, but it still seems pretty odd to be tracking somebody through your cell or laptop. However, I guess it works well for kids. Each tracking unit costs only RM369 and it comes with a bunch of features exclusively only on MeiTrack. KooZaa is also one of the official partners of Mobite Expo. They offer online IT purchase services. Simply sign up and like their Facebook page and receive a free mystery gift! 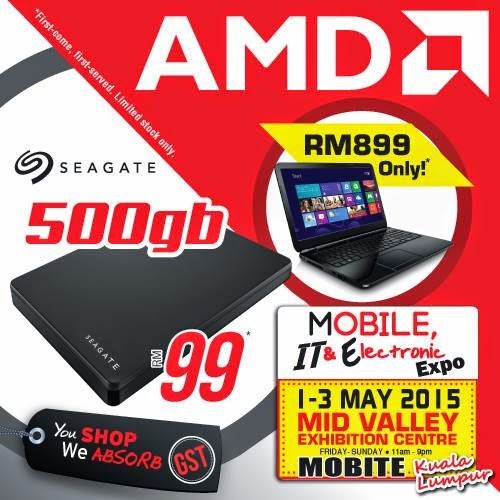 TechTitan, here is where you'll be buying the RM1 pendrive and other discounted products. I actually bought a laptop cooler here for RM25 - which was rather cheap I guess. Seems pretty durable for me haha. Vivo, another partner of Mobite Expo is here to feature their latest MX5 mobile phone - the world thinnest phone yet. Surprisingly durable too! Of course, I am a big fan of Doraemon since young. I have all the comics from book 1 to 45 and even the long story. Heck, I'm still reading it now on my phone. Since there was an additional 30% for us bloggers along with the waived 6% GST, I had no choice but to buy some. Also, do not forget to collect your free coconut ice cream from Sangkaya worth RM10! Last but not least, the winners for the Kaspersky purchase and win contest. The guy on the last 2 photos actually won a phone. However, if you wish not to purchase anything, you can simply sit back and enjoy the view. If you know what I mean. Here are more posters regarding the Mobite Expo promotion! 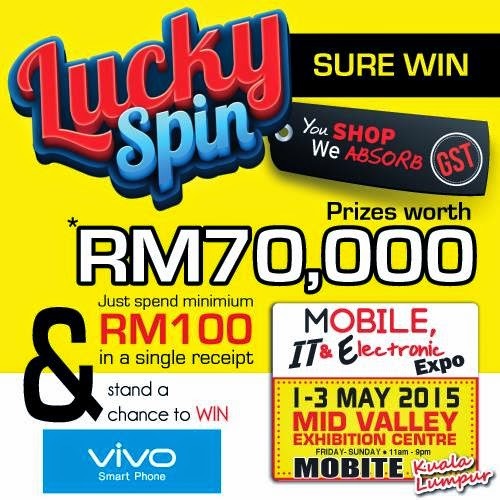 So, be quick and head on down to Mobite Expo Midvalley on the last day, 3rd of May, 2015! Mobistealth is an ideal program to save kids from bullies, drugs or the influence of other people. Besides, this sofrware is a perfect tool for employers who want to control their team remotely, have a peek at mobistealth here.